Between 1989 and 1992 the peoples of central and eastern Europe abandoned ‘already existing socialism’ to enthusiastically embrace capitalism. Whatever the Left’s collective critique of this model of socialism it represented a catastrophic defeat for the Left internationally and a general discrediting of the entire idea of socialism. Two quotes probably summed up the feeling. ‘The socialist experiment which began in 1917 ended in 1989 and ended in failure’. (Martin Jacques, Marxism Today, 1993). ‘The collapse of the Soviet Union was the greatest geopolitical disaster of the 20th century’. (George Galloway, 2010). The purpose of this article is not to delve into the reasons why after 40 years of socialism people flocked in their millions to welcome the free market system but rather to analyse where we are now. For the sake of this article it will not cover the Soviet Union, Yugloslavia and Albania but instead cover the former GDR, Poland, the Czech Republic, Slovakia, Hungary, Romania and Bulgaria. It will look at why socialism in these countries collapsed, what the experience of capitalism has been and where the Left is in these countries today. The starting point must be to look at how socialism arrived in these countries. Germany, alongside Hungary, Romania and Bulgaria were part of the axis powers defeated primarily by the Soviet Union and then occupied. Poland had been divided between Germany and the Soviet Union. In none of these countries would the people have seen the Soviet Union as liberators. Only in Czechoslovakia were the Red Army treated as such. It is also interesting to note that again, only in Czechoslovakia was there a mass basis of support for socialism in the shape of the Communist Party which was probably the largest and most influential party in the country in 1945. Therefore in most of these countries socialism was imposed rather than welcomed. From the start socialism was interconnected to Soviet security considerations. Given the experience of invasion during two world wars the Soviet Union wanted to create a security zone; later named the Warsaw Pact. This, rather than any ideological commitment to socialism was the Soviet Union’s prime concern. Evidence of this can be seen in Greece. After the war Greece was certainly ripe for socialism. The Communist Party was the largest party in the country. Ellas, a left wing partisan movement linked to the Communist Party was in effective control of large areas. Socialism had mass support while the monarchy and capitalist parties were divided and in crisis. Yet the Soviet Union put enormous pressure on the Communist Party not to take power a delay which allowed the Right to recover and emerge triumphant with the active support of Britain and America. It was later revealed that this was part of a secret deal between the Soviet Union, America and Britain in which the West ‘could have Greece’ while the Soviet Union ‘could have Romania’. Romania, rather than Greece was more useful to the Soviet Union as a buffer state. It is also worth pointing out that the primary reason for the Soviet interventions in Hungary in 1956 and Czechoslovakia in 1968 was the belief in Moscow that these countries were about to pull out of the Warsaw Pact. The second reason was in the nature of the socialist system which emerged in these countries. This can best be described as an authoritarian model of socialism; socialism without democracy. I am aware of the conflict inherent in this but bear with me. In the immediate post war years these regimes were overtly Stalinist in nature modelled closely on the Soviet Union. When Stalin died the Soviet Union developed a post Stalinist regime which removed the worst excesses of Stalinism while retaining the same authoritarian system. The countries outlined above followed a similar path with the exception of Romania. The lack of democracy created a specific problem. Authoritarian political systems are essentially rigid in nature fixed in a moment in time. However this doesn’t mean that the societies they preside over are unchanging. The irony is that these regimes oversaw the social and economic transformations of their societies for the better. War shattered, often pre-industrial economies were transformed into modern industrial system. Housing, health care, education and social care were greatly improved. Material living standards rose beyond all measure. While society was transformed the political system remained unchanged. What’s more the regimes saw all challenges to their system as a threat to be repressed, ruling out the possibility of reform. The exception to this was Czechoslovakia in 1968 when a movement to transform the system into ‘socialism with a human face’ was led from within the Communist Party only to be crushed by a Soviet intervention. The lack of democracy also created something else. Democracy is a very efficient political system because it is not fixed. As the economic and social base of society changes a democratic political system will adapt to these changes and change accordingly thus moving at one with society. At the same time if individuals or groups have grievances they have the opportunity to resolve these grievances in a democratic system. With an authoritarian system there is often nowhere to resolve problems so they fester and link up with other grievances and soon the grievance becomes generalised against the system. This was very much the experience in Eastern Europe. By 1989 it could be said that socialism collapsed because it had no mass basis of support; the exception being in Bulgaria where the collapse of socialism was greeted by a general air of disbelief. As could have been predicted the introduction of capitalism proved well short of being the ‘promised land’. The initial impact was a generalised economic collapse as industry after industry closed down. Hitherto extensive social provision was decimated while living standards plunged. Some countries such as Bulgaria and Romania have remained in this phase. The other countries have recovered a point although this development has been very uneven. Twenty five years on all these societies suffer extreme economic and social problems many largely unheard of under socialism. At the same time the world economic crisis caused by the banking disaster battered these economies exacerbating many of these problems. What has been the political response to this? The political spectrum basically divides into three; the Radical Left, the Centre and the Radical Right. The Centre Parties emerged strongly in the initial post socialist period embracing the new age of capitalism. Some described themselves as Centre Right emerging into prominence in the dying days of socialism. Some called themselves Centre Left often emerging from the wreckage of the Communist Parties to reinvent themselves. In reality these parties were essentially the same, sharing the same policies, agendas and objectives. As the capitalist dream has foundered, so have the fortunes of these parties. All are currently in crisis. In response there has been a marked rise in parties of the Radical Right most notably in Hungary with Jorbick. These parties have proved popular with their heady mixture of right wing nationalism, racism and xenophobia and their authoritarian solutions to their country’s problems. Their message is simple and effective. With the failure of socialism and western style capitalism a radical alternative is necessary. For the parties of the Left the past 25 years have been extremely difficult. The collapse of socialism wasn’t just about the ending of a specific socio-economic system in these countries it destroyed the very idea of socialism. For the Left to progress is had to develop a coherent critique of the previous system, remain true to the basic principles of socialism and relaunch the socialist project with a vision of socialism very different from the past. In Poland, Slovakia, Bulgaria and Romania the socialist left remains very weak with little or no parliamentary representation. Various Democratic Left/Social Democratic Left /Green Left type parties have emerged with one overwhelming thing in common; their rejection of anything which can be described as socialist. The exception has been in the former GDR and the Czech Republic. When Czechoslovakia split between the Czech Republic and Slovakia the Czech Communist Party (called the Communist Party of Moravia and Bohemia – KSCM) emerged. What was initially striking was its refusal to drop the name Communist. This has led to various attempts to ban the party, in fact its youth wing was banned between 2006 and 2010. The party remains firmly committed to the ideas of socialism although has developed a strong critique of the previous socialist system. Instead their programme envisages a democratic model of socialism with a variety of forms of social ownership replacing the idea of universal state ownership. They are part of the European Left and the Nordic Green Left Bloc in the European Parliament. With around 100,000 members they have consistently polled well in elections making a breakthrough this year in the recent parliamentary election with almost 15% of the votes (741,000 votes – 33 seats) and finishing the third largest party. Their strongest base appears to be in former industrial areas and the party retains a strong ‘workerist’ identity. The success in the Czech Republic is matched by the situation with Die Linke (The Left) in Germany whose strongest base is in the former GDR. In the recent parliamentary election they emerged as the third largest party with almost 9% of the vote and 64 seats. In Berlin this rose to around 12% and in other parts of the former GDR its vote often ranges from 18% to 24%. Formed in 2007 from an alliance of what was left of the old East German Socialist Unity and a left breakaway from the Social Democratic Party they have around 65,000 members. 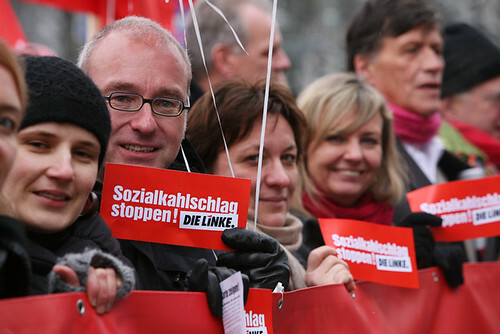 Interestingly the rise of Die Linke has also been accompanied by increased state supervision similar to the Czech Republic with around a third of their parliamentarians under investigation. What has become obvious is that the crisis of socialism in 1989 was quickly followed by a ‘crisis of capitalism’ which is still very much on-going. This has led to rise to radical forces which now challenge the existing status quo. In the Czech Republic and in the former East Germany that challenge has come from the Left but elsewhere it has come from the forces of the Radical Right; some of whom are openly fascist. The best example of this is the Jobbik Movement in Hungary which recently polled almost 20% of the vote. Jobbik are openly fascist even to the extent of some of their members wearing paramilitary uniforms and insignia modelled on the Hungarian fascist movement of the 1930’s. They glorify Hungary’s inter war fascist leader, Admiral Horthy and are openly racist and anti-Semitic. The rise of Jobbick and similar movements are not difficult to explain. For millions of East Europeans the failure of socialism was followed by the failure of capitalism. The rise of authoritarian, right wing movements who blame internal forces (national minorities) and external forces (the EU) for their country’s problems is perhaps inevitable. The situation in these countries remain s volatile with countries like Bulgaria and Romania resembling ‘third world failed states’ to quote the Guardian from some time ago. What is clear is that capitalism is simply unable to resolve some fairly major problems and is directly to blame for many others. Socialism remains discredited although probably less so with the passage of time. There is certainly evidence that some of the older generation look back fondly to a time of economic security, good social provision, full employment and greater equality. However, it requires a younger generation, not encumbered by anti-socialist baggage, to rebuild the socialist movements in these countries.